Before getting to the flying, let's talk about the main storyline in "Nanda Parbat." 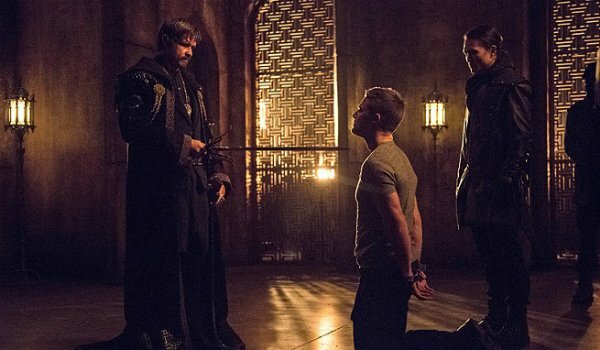 Of course, the title refers to the location of the League of Assassins' base of operations, but the episode's action is split between there and Starling City. Nyssa, still mourning the loss of her beloved Ta-er al Sahfer, interrupts Ra's chilling in what could be the show's version of a Lazarus Pit (he does mention an encounter he had in 1864, after all) to inform him that Oliver survived the trial by combat. Ra's, being Ra's, is already aware that his former opponent is alive and, in addition, not responsible for Sara's death. Meanwhile, the man who is responsible, one Malcolm 'The Magician' Merlyn, is busy training Ollie and Thea for the next time they cross paths with the Demon's Head. The training does seem to be paying off since the Arrow is able to make rather quick work of Nyssa with some trick arrows before he and Dig jet off (thanks, Lyla) to Nanda Parbat to try and rescue Malcolm. Once again, our hero's ego gets him into trouble as he underestimates Ra's but, lucky for him, the leader of the League doesn't want a rematch. He wants a successor. In Starling, Roy does his best to try and comfort Thea with stories of "Seeing Red" but she would rather just come clean. First with Laurel and then with Nyssa, the latter serving as possibly an even bigger cliffhanger than the offer made to Oliver. During the squabbles amongst Team Arrow, the episode also makes mention of Simon Lacroix (aka Komodo), Lian Yu's super-max prison and a suicide mission. It was full of (familiar) references. The flashbacks during "Nanda Parbat" were also filled with familiar DCU Easter eggs, starting with a quick recap of how Oliver and Maseo managed to obtain the Alpha and Omega (two elements that we know are crucial to that certain someone taking flight) from China White before she was able to sell them to the highest bidding bad guy. Because of the Mockingbird's part in the mission's initial setbacks, Agent Amanda Waller and A.R.G.U.S. were removed from the situation, and now General Matthew Shrieve (the leader of the Creature Commandos in the comics) is in charge. 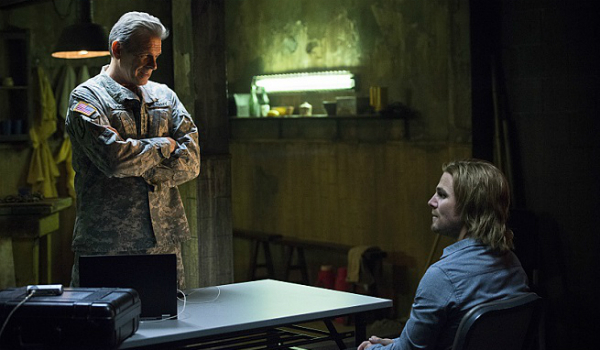 And that seems to be a good thing for Oliver as the Army apparently signs off on him returning home. Of course, things are never that simple, as he and the Yamashiros are ambushed as they try to leave, and Oliver is forced to separate Akio from his parents. The best part of the sequence was Tatsu killing that dude by throwing a pipe. She's such a badass. We need more. Okay. Let's talk about the that someone I've been alluding to this whole time. While I wasn't that impressed with the first look at The Atom's suit, the live-action reveal was pretty rad. I mean, who doesn't want to see Brandon Routh back in the blue and red flying through the sky? I wasn't a fan of Superman Returns, but I was a big fan of Routh's Clark Kent/Man of Steel and would love to see his Ray Palmer get a spin-off. The CW's newest superhero spent most of the episode frazzled, trying to get the last pieces of his super-suit in place so he would never again be helpless in the face of men like Danny 'Brick' Brickwell. 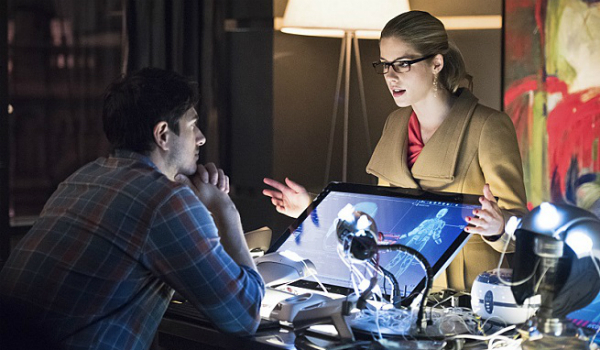 In the end, all it took was some sweet loving from Felicity for him to figure it out. I'd be flying too. Like its sister-superhero-show The Flash, Arrow will be taking the next few weeks off. The series continues with Episode 16, “The Offer,” on Wednesday, March 18 at 8:00 p.m. ET on The CW. Created by Marc Guggenheim, Andrew Kreisberg and Greg Berlanti, the DC Comics inspired series stars Stephen Amell, Katie Cassidy, David Ramsey, Emily Bett Rickards, Willa Holland, Colton Haynes, Paul Blackthorne and John Barrowman.